In 2013, the day before Thanksgiving I drove out to Virginia and picked up my very first dog, Cher. A timid and shy chihuahua pug mix who didn’t realize I was probably just as terrified of her and what to expect as she was of me. This was the first picture I ever took of her and sent to my husband. 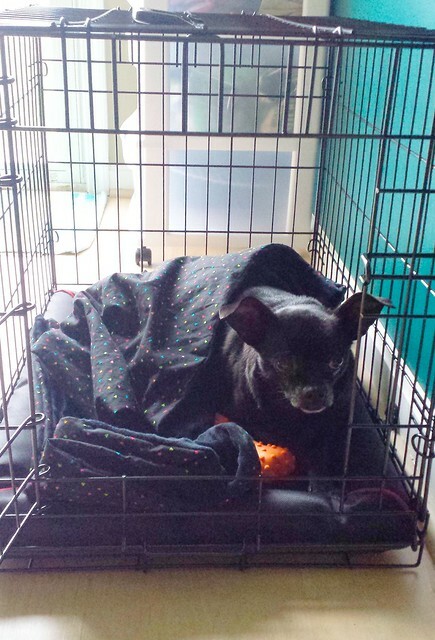 I sewed her a blanket, bought her a chew toy (she never touched it)and tried to make her crate a cushy environment. The harnesses and collars I picked up were either too big or too small and she wouldn’t come out of her crate! Oh I was worried she’d hate me. By the end of the week I knew it was going to be okay and about 3 months later I realized she knew she was home when I found her snoring heavily on the back of the couch curled up in blankets. Fast forward 4 years (her gotcha day is actually Monday) and Cher’s got a little sister, Jellybean and a pretty cushy life. 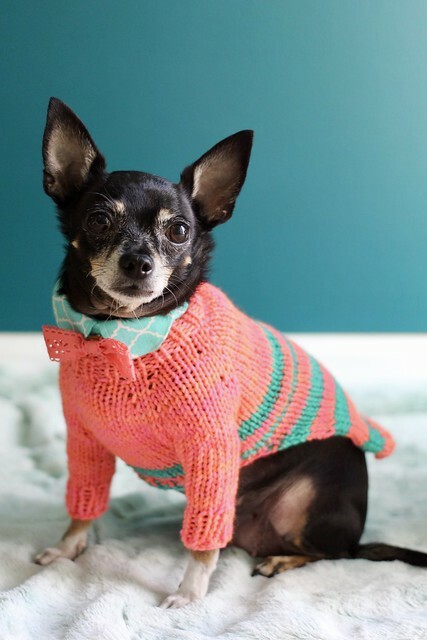 So I was thinking about making the girls sweaters that coordinated for the holidays and I realized the collars my friend Salina made them last year, would match my favorite yarn, madelinetosh in neon peach. 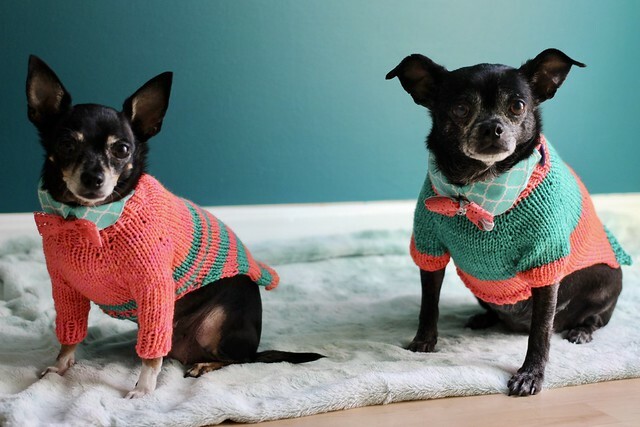 I had just enough of that yarn and the turquoise shade called Canton from this sweater to make my girls sweaters to coordinate with their collars. These two are getting to be posing pros! 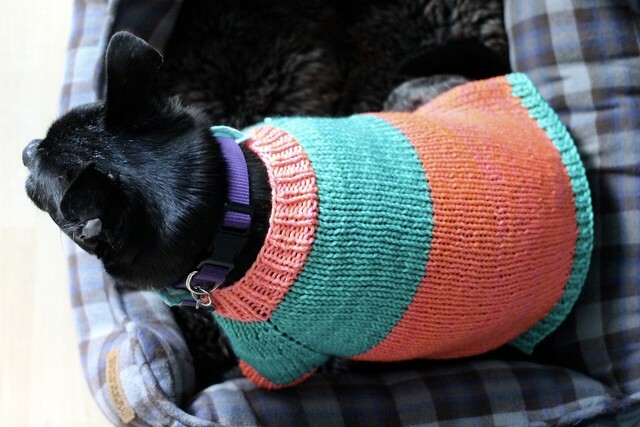 LOL The sweater pattern I loosely followed was the Waldo pattern from the Seamless Knits for Posh Pups book – a favorite of mine. 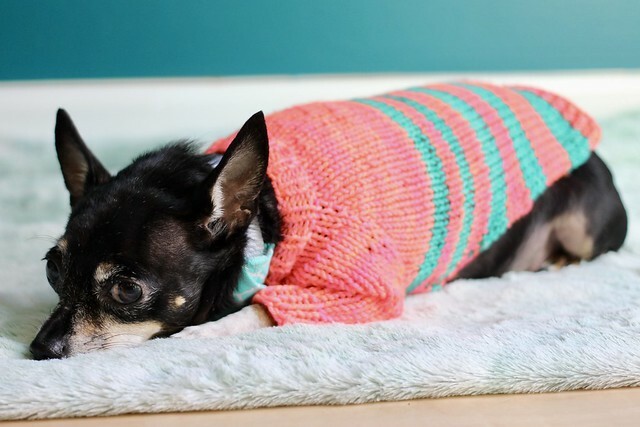 It essentially gives you the basics to create a simple top down raglan sweater for a dog and is easy to modify. I changed up the stripes and added a bit of ease to the sleeves and shortened the length. But I whipped these both up in a 24 hour period. I made Jellybean’s sweater first. I knew I wanted to make a colorblocked sweater for Cher with the blue but wish I had done Jelly’s collar in blue because you lose the ribbon since it matches almost perfectly! But it’s still super cute. I just did a few stripes on the lower half of her sweater and the stripes get gradually larger as they go down. Jellybean also realized if she did like Cher, sat and took pictures calmly then she’d get treats. I took this last pic after I was finished taking pictures but she went back to the mat to wait for a treat for being good. Of course I rewarded her. Although the sleeves are long in these pics after putting it on her and having her wear it all day I decided to cut back the ribbing and make the sleeves shorter to make it easier to put it on her. It was a smart choice but the longer sleeves do look really adorable. Cher’s sweater is the same pattern but I went with shorter sleeves from the beginning. I don’t really put Cher in sweaters unless we’re going to be around people and I want her to be festive or if it’s really, really cold outside and I add it as a layer to her coat. I love the big blocks of color on this sweater. But I also love that Beanie’s sweater is so bright and fun like she is. I think they match their personalities and they match the collars so well. I’m going to have to put on my Cracked Pepper sweater and take pics with them in their sweaters at some point. I’m taking off from the blog the rest of the week for the Thanksgiving holiday but I really am thankful for these two little dogs. I get teased a lot because I treat them like family but to me they really are a part of my family. And their love is insanely pure. Have a wonderful Thanksgiving you guys! I hope you get in some quality knitting time in between time spent with family and friends. Awww thank you and I hope you had a great holiday! These photos made me smile! I’ve been feeling so sick today and they made me forget about it 🙂 they look awesome and super cute. There’s something about dogs with long sleeved outfits, isn’t it? 😉 My parents’ dog used to have this heavy winter jacket with full length sleeves and legs and it was just so adorable. Also, they are part of the family so it’s only natural to be treated as such! Well I’m happy i made you smile and I’m hoping you’re on the mend soon! Your girls are lovely, and it’s plain that they adore you! 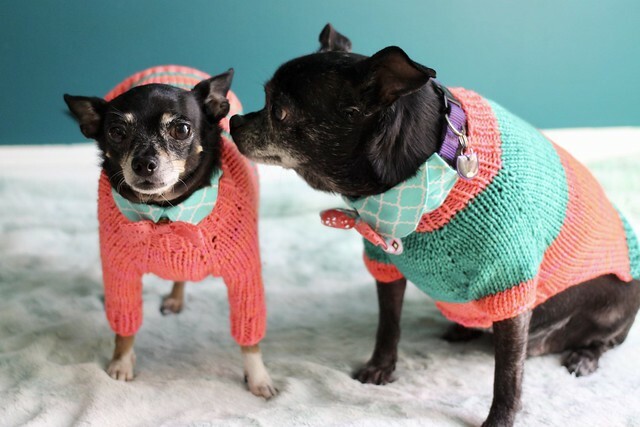 I love the sweaters… and resonate to your rescue story for Cher. My little cat was a stray before we got her. We brought her into the house and opened her carrier, and she went straight behind the washer and stayed there for the next week. The fact that she came out for meals and bathroom needs encouraged me. She was both hungry and clean, but we weren’t sure she would ever like us. Famous last words! She is sleeping right now on my husband’s feet, and he’s so fond of her that he doesn’t dare “inconvenience” her by getting up. Happy Thanksgiving to you and yours, DWJ! Hahahahaha don’t you just hate disturbing them?! They’re the pets! I completely understand being thankful for dogs. Mine came into my life with my now husband. 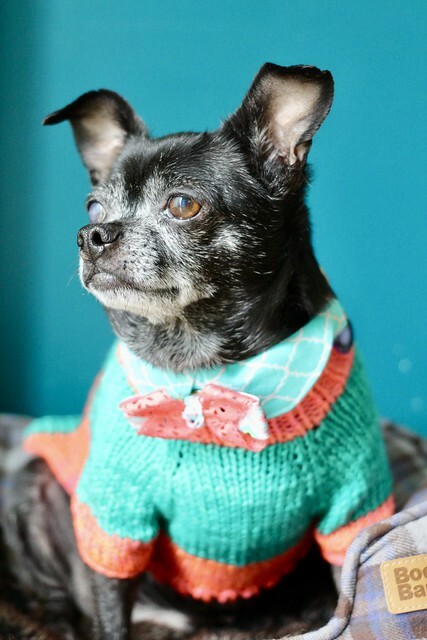 And our latest, also a black chug, looks awesome in sweaters and send to appreciate them when it is cool. OMG! The images are soooo cute; I feel like you have some natural talent on your hands (both your own and your dogs). Love the sweaters! I find that Jellybean is quite a ham! LOL she likes the camera and knows she’ll get treats. Absolutely adorable! Again … love your color combo! My girlfriend went for that color combo with the colors but blue and peach have always been a favorite. I was just excited I had my favorite yarn leftover to make something fun!